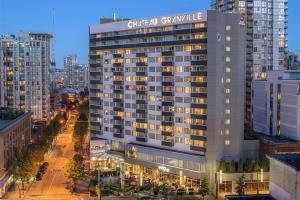 The Best Western Plus Chateau Granville Hotel & Suites & Conference Center features rooms and suites with balconies overlooking the heart of downtown Vancouver. The hotel features 28 superior view rooms, as well as 90 spacious suites with private balconies affording magnificent views of Vancouver's enchanting city lights. Thoughtful amenities including free Wi-Fi and flat-screen TVs will make you feel right at home, while a well-equipped fitness center enables you to stay on track with your exercise routine. The adjoining Edge Social Grill & Lounge offers a variety of delicious dining options. Vancouver International Airport is 6 miles from the hotel. The Canada Line Subway, offering direct access to Vancouver Airport, is only three blocks away.